This year, our guest blogger in South Africa will once again keep an eye on the journey to find the next Miss South Africa. Every week, our blogger (who wishes to remain anonymous) will share their thoughts and opinions about The Road to Miss SA series as well as keep eye on the contestants who have the potential to do well internationally. There will also be a review of the final, and comments about the production in general. Eye For Beauty Blog is not based in South Africa and we are not able to follow the Miss South Africa Pageant closely. With days left before the crowning of a new national queen, Miss SA concluded the 5th episode with the announcement of the Top 12 finalists. Ecstatic: The 12 happiest young ladies in South Africa react after being called in the top 12 of Miss South Africa 2012. * Michelle Mulder is only 18 and finished matric last year. * Dhesha Jeram is a sales representative for Hugo Boss. * Taryn Kim was a victim of being bullied. 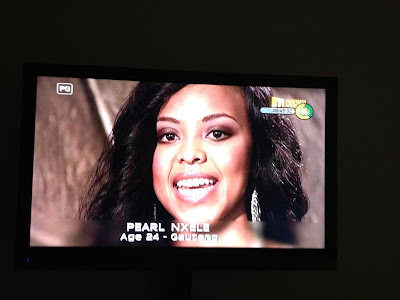 * Pearl Nxele is involved in the Sundowns Football Club and is passionate about sports. * Charlotte wants to improve the unemployment rate by focusing on entrepreneurship. 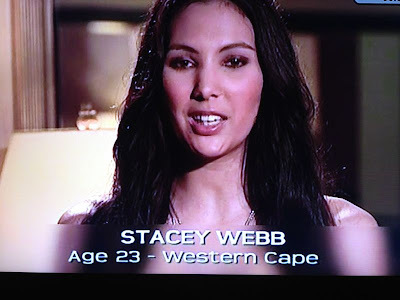 * Stacey Webb should win congeniality, the judges always seem to find her hilarious whether it's her explanation of reading "50 Shades of Grey" or agreeing that Miss SA should be gay, straight or bisexual. * Julia Peterson said she's been holding back because prior to entering the competition people advised her not to laugh and be her crazy usual self. Her parents also warned her about accent-control. The top 16 all flew to Sun City for a final round of judging. Swimwear and interviews. It seems as if though there has been a change in the voting as the contestants all spent time with the judges INDIVIDUALLY and they scored each contestant, as opposed to the panel judging. It's also the first time that Sonia Raciti did not read the names of the Top 12 from a list, but as each contestant came down to receive the news of her fate, an envelope was opened to reveal whether or not she was staying in the competition. This definitely comes off the back of recent allegations towards Sun International for fixing the results. I am glad that the pageant seems to be more fair. Michelle Mulder, Toni Smidt, Joanna Jewell, Julia Peterson. The 4 contestants who were eliminated were Joanna Jewel, Toni Smidt, Michelle Mulder and Julia Peterson. I must say I was somewhat disappointed that Michelle and Toni were eliminated. They were far more unique looking than MANY of the Top 12 and I do hope they would return on day. Marilyn Ramos: She entered twice before. In fact I feel this year is the year of the "leftovers" and many returnees. She is not the strongest. 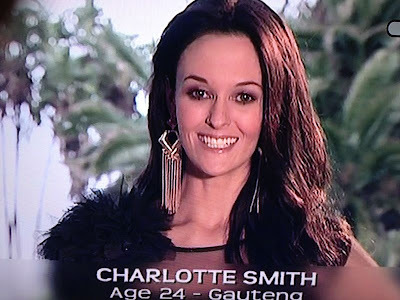 Charlotte Smith: Very strong in interview, also made the Top 16 last year. But she is not as facially strong. She is however very intelligent but seems a bit rehearsed. Taryn Kim- I like her and she's cute. 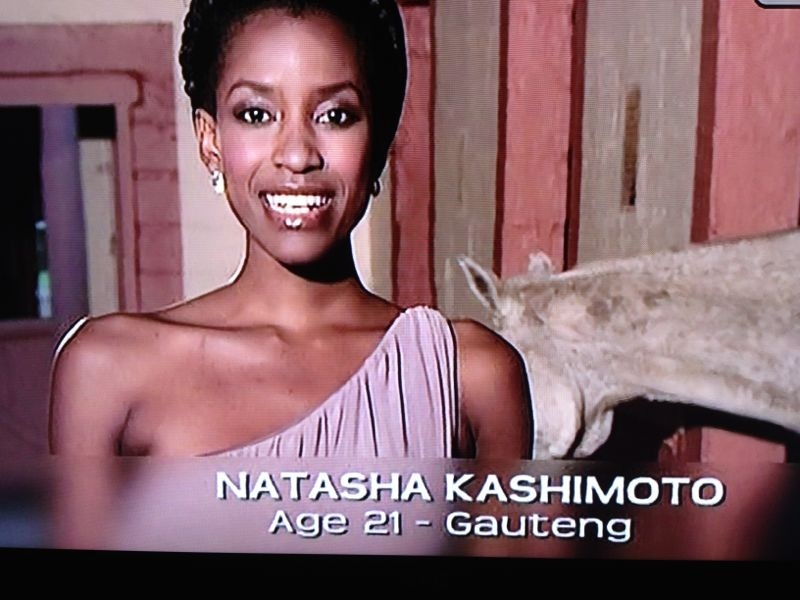 She would have been a nice "Teen" winner but I don't see her as Miss SA. Simone de Kock: If I had it my way, she would win. Sadly there is so much politics involved in this pageant that two white women will never win in two consecutive years, but she is IT! She is by far the most beautiful contestant this year. Danelle de Wet: Pass. I don't see her as strong at all. Pearl Nxele: There are only three black contestants in the Top 12 and she and Natasha will both go as far as the Top 5. She is so bubbly and sweet and beautiful. 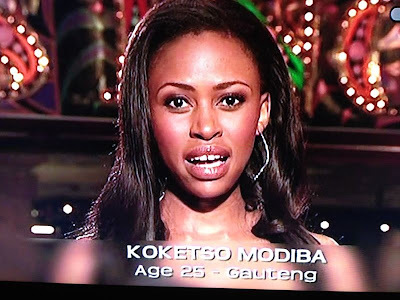 I see her really doing well at the Miss World Pageant. In fact out of all the girls in this year's pageant, I would elect Pearl to go to Miss World if there was indeed two winners. Cindy Rosslind: This year she is strong. She is well spoken but her accent is absolutely terrible and she needs to work on that. She is also not amongst the prettiest. 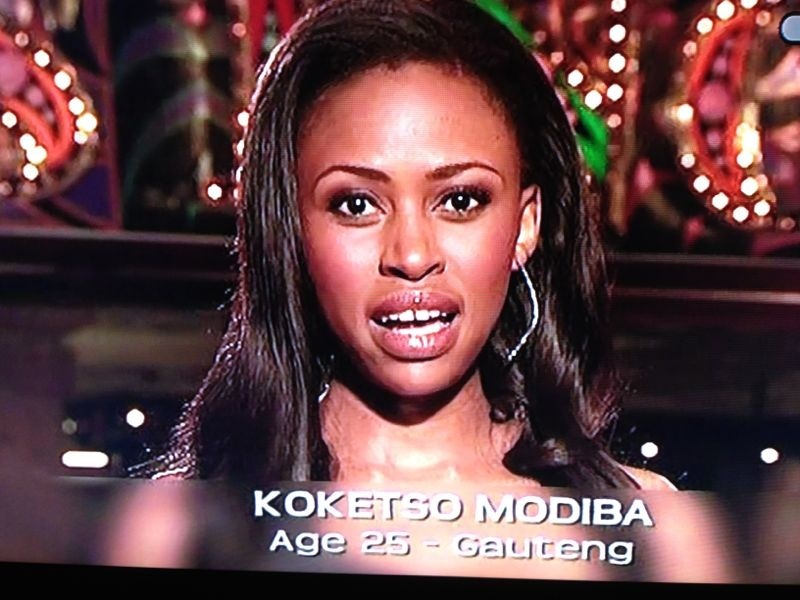 Koketso Modiba: Sorry gal, I aint just feeling it! Dhesha Jeram: Now here's an interesting girl. I think she will win, but I hope she doesn't. I find her to be a tad obnoxious, and I don't find her to be THAT beautiful. Yes, there is no doubt in my mind that she is Top 5 material, but I don't find her to be as facially stunning and would place her under the Tatum Keshwar type of Miss SA. An average face with super skills on the runway and well spoken. Stacey Webb- she's cute and funny and could win Miss Congeniality but as far as winning the crown goes, I don't think so. Natasha Kashimoto: She's just a stunning girl with class and who seems intelligent and confident and is very very strong. I see her making Top 3. But not winning. 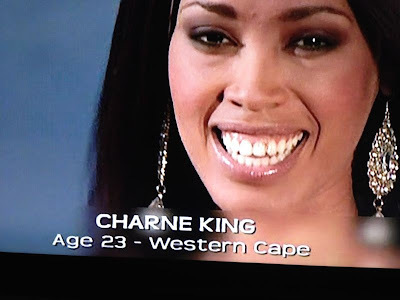 Charne King: She's a very strong girl but she looks years older than 23 and I just don't find her that facially beautiful. Good luck to all the ladies competing this Sunday. I will send in my final review next week. Remember to tune in at 4.30pm for the final episode of the "Road to Miss SA" and the red carpet ceremony, with the LIVE event starting at 5.30pm. All ideas, thoughts, comments, and critique expressed in these articles are solely those of our guest blogger and does NOT necessarily represent those of the editor of this website. I would like to make it clear that I have always been a great supporter of the Miss South Africa Pageant and that even traveled to the Miss World Pageant on two occasions to support Miss South Africa. It is my sincere hope that the organizers of Miss South Africa will take all the support, comments, and even criticism they get and use it to make the pageant relevant again. We do not want the pageant to suffer the same fate as its little sister, Miss SA Teen. 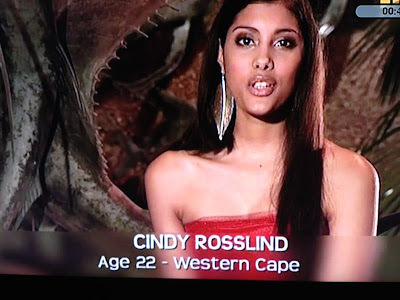 Cindy is Beautiful and has a unique face, even when comparing her to lots of different pics, her face stands out, she has the type of face that would stand out at the Miss World or Miss Universe Pageant. It catches one immediately, Like Miss Malaysia or Miss Philippines, with some help she could win the Title for South Africa.